I just love exploring old factories, mills, dockyards, etc., places where people once worked. I find them very atmospheric, and it’s easy to imagine all sorts of skulduggery going on. So, when I had to chance to visit Three Mills, I jumped at it. Tucked away in Bromley-by-Bow is one of London’s best kept secrets. Mentioned in Domesday Book, Three Mills has been milling for over a thousand years on a tidal stretch of the River Lea. The third mill, a windmill, was demolished in the mid nineteenth century, and what we have left is House Mill, an 18th century Miller’s House, a Custom House and the Clock Mill. We know that, in the 12th century, the mills were owned by the Cistercian abbey of Stratford Langthorne and, after the Reformation, they became privately owned but continued to mill grain from the surrounding area. 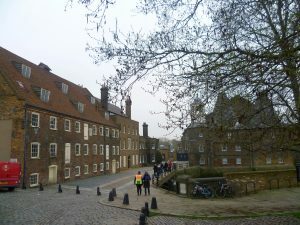 In the 1730s the Three Mills were bought by a consortium which included several Huguenots, and the mills became gin distilleries – you can just see two oast houses to the right of the clock tower – which became immensely profitable. In 1763, the Miller’s House was built; it was obviously a gentleman’s residence; we know it had a marble floor and an elegant staircase. There were also houses for the workers, warehouses, stables, carpenter’s shops, and so on. The Three Mills Distillery ran until 1951. The buildings deteriorated fast and it looked as though they might be lost completely; by 1966 they were on the English Heritage Buildings at Risk Register. 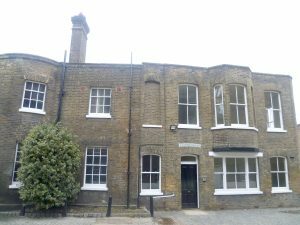 Fortunately, after a vigorous campaign, they became part of the Three Mills Conservation Area and the River Lea Tidal Mill Trust was set up. The Miller’s House, bombed during the war, had its façade restored using many of the original bricks. The Trust is now looking to raise five million pounds to restore the machinery to full working order. 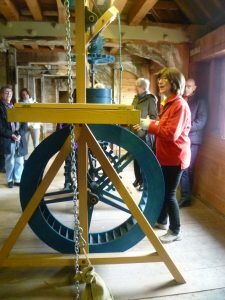 You can go round the House Mill in a group with a friendly and knowledgeable guide – not to mention a lot of health and safety warnings. There are dodgy floors, awkward stairs and things to trip over. However, it’s definitely worth it. The House Mill is built on five levels. 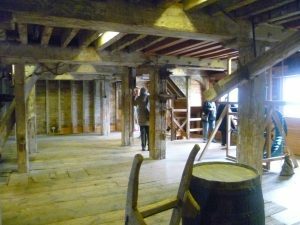 Grain was brought in from the surrounding area by barge and stored in various Grain Bins, large wooden rooms which could hold 10-15 tons of grain each. 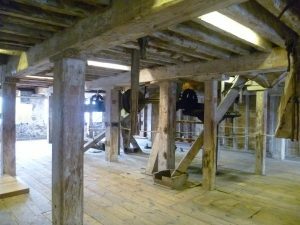 They were then hoisted up to the top floor, originally by hand and later by machinery. Electricity wasn’t installed until the early 20th century. We stared our tour inside one of the wooden Grain Bins. The greatest threat to the mill was fire – so no naked flames and nothing metal either (sparks are dangerous). The interior of the mill was whitewashed throughout to maximize the light and the working day was governed by daylight and the tides. The House Mill is built on top of Bow Creek, part of the river Lea. Twice every 25 hours, the tide was funnelled up a channel underneath the mill – it was tidal upstream for five miles, so a lot of water went under the mill. When the tide turned, the tides gates closed, trapping the water. 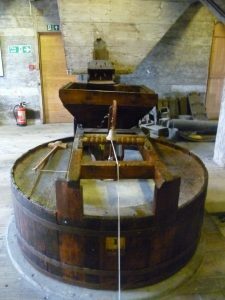 Once the water level had reached 4½ feet, the sluices were opened and the water wheels began to turn and the millstones could ground the flour. In 1938, the House Mill operated for six to eight hours on every tide. The beauty of it was, of course, that the energy produced was free; all the miller had to do was to harness the water in the most efficient way. Our guide, Christine, explaining how the machinery works. Having seen one of the Grain Bins we went up to the Smutting and Dressing Floor at the top of the mill. 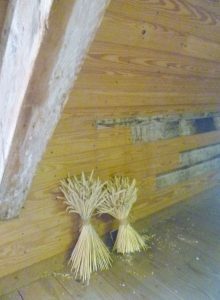 This was where fans and brushes cleaned the grain to get rid of harmful funguses, such as ergot. A lot happened on this floor and Christine, our guide, demonstrated how the machinery worked with this model. I assure you, I understood it perfectly when she told us and I appreciated how neatly it all worked but, alas, I just don’t have the sort of brain that can pass on the information. However, I did admire the look of the space. I love seeing old machinery in its original place, there’s something very aesthetically satisfying about it. We then went through to the pattern room which housed a vast number of light wooden patterns, or templates, all carefully labelled, so that if you needed to replace a bit of machinery, you simply took the appropriate template to the foundry and ordered a replacement. This room reminded me of the Whitechapel Bell Foundry. It looked cluttered but, in fact, everything was in its proper place. When the machinery was operating it made a hell of a racket and the entire place shook. This was where the mill being constructed entirely of wood and without nails, really helped. The wood absorbed the juddering and, when it stopped, the building settled down again. The ‘ship’s knees’, that is the wooden brackets which once held the sides of ships together, also helped. 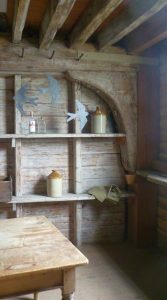 In the mill, they are on one side of the room only, instead of being on both sides, as in a ship’s hull. They provide some stabilization against the shaking but not so much that the building becomes dangerously rigid. 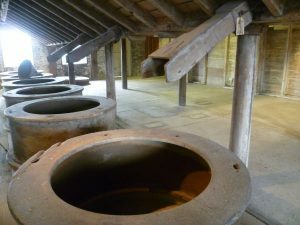 Once the smutting and dressing was over, the grain went down chutes to the millstones on the first floor to be ground. There are two sets of millstones here. On one side of the room there are four traditional millstones made of quartz French Burr Stone. The bottom millstone is static; it is the top millstone which does the grinding and its surface is criss-crossed with grooves to help scatter the grain. In the photo above you can see the mouth of the wooden chute which drops the grain into the hopper. The millstones are bound by wooden walls, making it look rather like a truncated beer barrel. The object which looks like a wooden hammer on the left is the damsel, this moved from side to side to make sure that the grain flowed evenly. It is called a ‘damsel’ because it makes a chattering noise – like young girls. The little bell rang once the load of grain was ground. 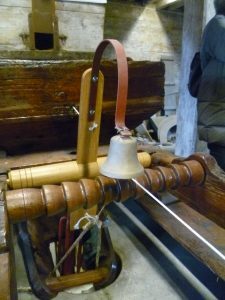 Each of the four bells has a different tone so that the workmen knew which millstone needed attention. 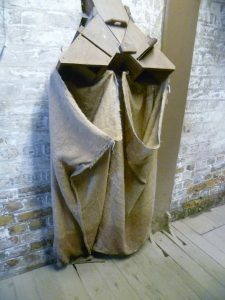 The bells were among the very last bells to be cast by the Whitechapel Bell Foundry. 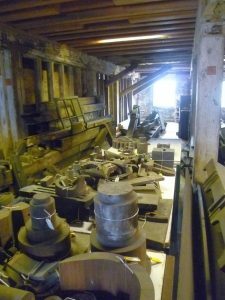 On the other side of the room, seven new Fairbairn’s ‘silent’ millstones were installed in 1878-1886, together with two bigger waterwheels and various other changes. So the damsels chattered no more, and the new millstones, if not silent, were certainly quieter and more efficient. 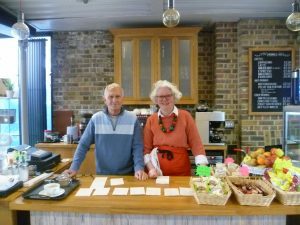 Finally, we exited by the back door to see the outside of the mill on the river side, before going into the café where Beverley Charters, one of the House Mill trustees, and Volunteer Tony gave us coffee, sandwiches and warming soup. Fascinating! I love learning how things work. I do so agree, Jan – even if I only half understand it!